How do I create a tiered promotion? What is a tiered promotion? A tiered promotion allows you to create promotions that aim to increase average order value. Customers are invited to buy more to save more. Discount Ninja allows for up to three promotions. Define up to three tiers and configure what you want to offer (percentage, fixed fee or free shipping). 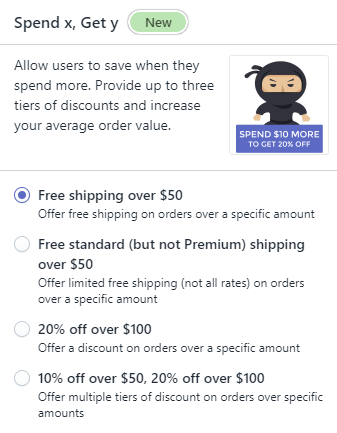 How does Discount Ninja determine how much the customer is spending? Discount Ninja calculates this based on the total cart value, including items that may not be in your promotions.